Built by Duball, LLC with institutional capital partner CIM Group, and operated by Crescent Hotels & Resorts, Cambria Hotel & Suites stands at 1 Helen Heneghan Way (recently named for a former beloved City Clerk) between the Regal Theater and the headquarters of Choice Hotels International. The 140-room hotel spans eight floors of the 15-story west tower, the first of two towers in the mixed-use high-rise complex. A parking garage is built into the building’s structure, giving guests a convenient place for parking and allowing all rooms to enjoy an exterior view. In addition to the Cambria Hotel, the complex will also be home to 40,000 square feet of street-level retail space and includes the Upton apartments. This hotel has a contemporary urban feeling by being situated up in a skyscraper and by a design that is simple and clean, with rooms running from 350 to 650 square feet (one room I visited was ridiculously big, even with two double beds and a sofa). James Millar, director of architectural and interior design, explained that their decisions are based on consumer preferences for spaciousness and choice. Spaces that were typically segregated are now blended to provide more options. For example, Millar designed the rooms so that business can be conducted comfortably from a sofa near a window or at a table with a lamp—or even in the lobby. Here spaces follow the desire to be “alone together.” Guests can enjoy a drink while working comfortably in the lounge, able to see the activity in the lobby while not being disturbed. Indeed, the lobby features an attractive bar that also provides light meals, such as steak sate, fried caprese kabobs, and kobe “corn” dogs with curry ketchup. This will be a nice place to hang out before a movie or to meet a business colleague. For local businesses and organizations, Cambria offers three meeting rooms that can accommodate up to 106 people for banquets and conferences, all equipped with high-tech audio and visual equipment. This is the first hotel to open in downtown Rockville in the last fifty years. Perhaps the last one was the Rockville Plaza Motor Hotel on Washington Street, now Beall’s Grant. Several years ago, Rockville Economic Development, Inc. (REDI) identified several types of improvements needed in downtown and a hotel was among them. Hotels stimulate the local economy because they continually bring new customers who will very likely dine and shop nearby, which is especially attractive when downtown offices empty out in the evenings. And in this particular case, the Cambria will also host employees, contractors, and vendors who work for Choice Hotels International (they’re not going to stay in a competitor’s hotel). The Cambria Hotel is also the last piece in a long chain of events to revitalize downtown that started five years ago, when Choice Hotels International was seeking to move from its headquarters in Silver Spring and prompted both Montgomery County and the State of Maryland to find ways to keep this major business from departing. 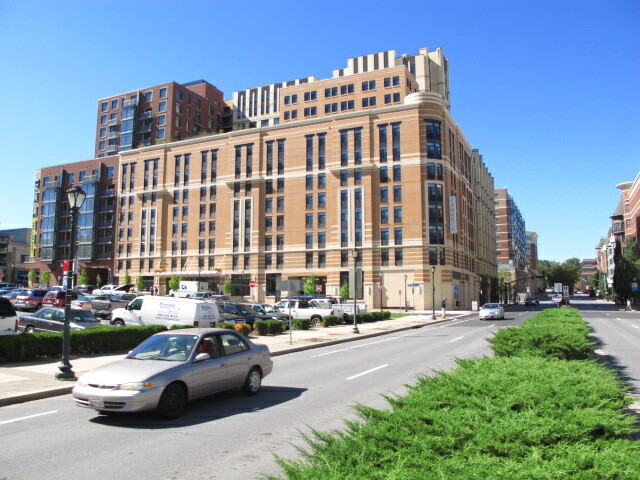 Although Choice Hotels announced their intention to move to Rockville in 2010, the complex negotiations over various incentives with three government agencies (state, county, and city) continued into the next year (remember the attempted renaming of Middle Lane?). It was ultimately decided that Montgomery County would loan $2,976,150 and the City of Rockville would loan $156,000 to Choice Hotels, which could only be used for the acquisition, construction, and installation of their new offices. In return, Choice Hotels would lease 125,000 square feet of office space for ten years in Rockville and employ fulltime at least 325 people in the county and pay at least 150% of the federal minimum wage. If they met these terms, the loans would become grants (the terms are actually more complex, but these are the basics). The Rockville Mayor and Council approved these terms on August 15, 2011 in Executive Session. Although the terms were in place, the actual written agreement took more than a year to complete, thanks to all the lawyers and finance officers involved. When the final agreement was ready for the Mayor and Council’s signature on November 5, 2012, the deal nearly fell apart in one of the City Council’s strangest decisions. Despite being part of the negotiations, Mayor Phyllis Marcuccio now questioned the incentives and asked if the City Council had actually agreed to them. Councilmember Bridget Newton pushed further, questioning if there was any documentation to support their previous agreement. After some discussion between staff and Council about the process, they finally voted. Councilmembers Mark Pierzchala, Tom Moore, and John Hall voted to approve the agreement but strangely, Mayor Marcuccio and Councilmember Newton abstained. Yup, they didn’t vote “yes” or “no” but abstained, as in “to choose not to vote.” Umm, weren’t they elected to make decisions? After working on this for two years, how is it possible that they couldn’t reach a decision? After weighing the pros and cons, they didn’t offer an alternative or better idea, but instead could only come up with, “I don’t know”? And while some may believe that an abstention is a “neutral vote,” it’s actually a wimpy but effective “no” in disguise. If a third councilmember had abstained or voted no, this agreement would have fallen apart and we would have lost Choice Hotels International in 2013 and the Cambria Hotel in 2015, and Rockville would have been back where it was in 2010. Thank goodness the majority of the City Council had common sense and fulfilled the City’s promises.